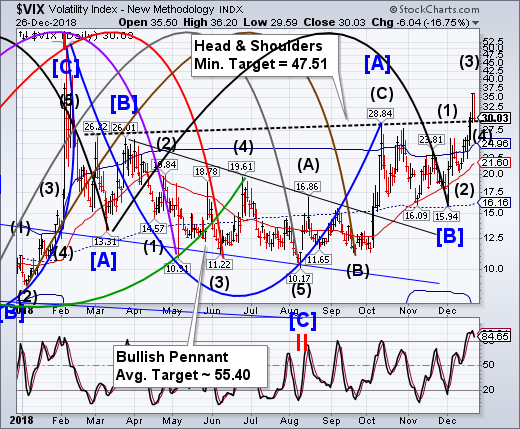 VIX broke above the Head & Shoulders neckline at 30.00 on Christmas Eve, then pulled back to retest neckline support today. The VIX has been on a buy signal since October. There appears to be no commentary on the VIX in the media. 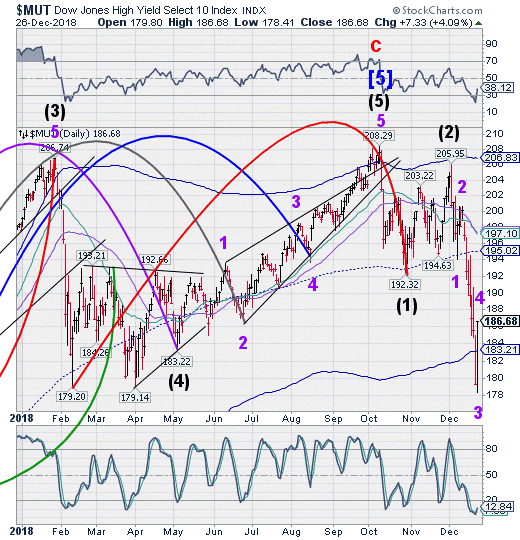 -- The NYSE Hi-Lo Index shows its bearish side by continuing to close beneath the Cycle Bottom resistance. The Cycles Model anticipates a further decline through the end of December. These are daily numbers, not cumulative. (ZeroHedge) For years, as the market rose in seemingly uninterrupted fashion buoyed by trillions in excess central bank liquidity and algos programmed to buy any dip while frontrunning each and every buy order, virtually nobody - except for a few "fringe", "fake news" blogs - complained about the threat posed by algo trading and the quiet but dire deterioration in market liquidity. Now that the S&P has finally suffered its first bear market in a decade, the mass media is out in full force looking for scapegoats and, predictably, in an attempt to deflect attention from the biggest, and only, culprit behind each and every bull-bust cycle namely the US central bank, has focused on "computerized trading." 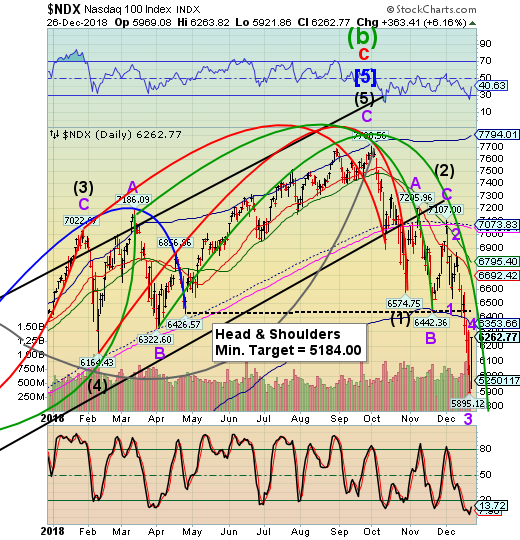 -- Today’s rally in the SPX was one for the records, but still a bear market bounce. This may be enough to relieve the oversold condition. However, there is more downside risk this week, according to the Cycles Model. (ZeroHedge) Last Friday, when stocks were tumbling, we reported, "some good news for the bulls" which was lost in the overall chaos over the latest mutual fund liquidation discussed earlier. 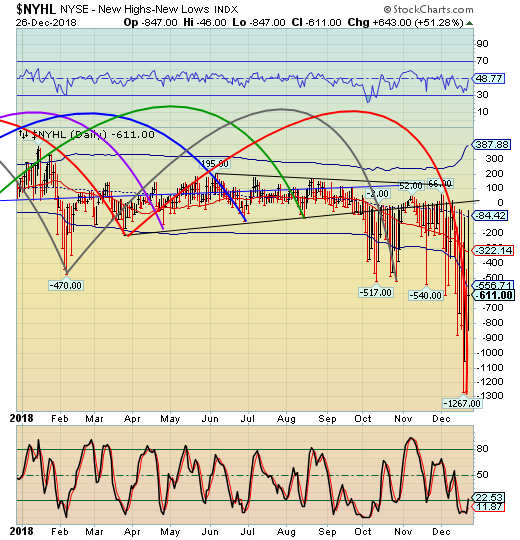 -- NDX bounced today to possibly test resistance at its Cycle Bottom at 6353.66. There appears to be one more probe to lower prices that may continue through the year-end. 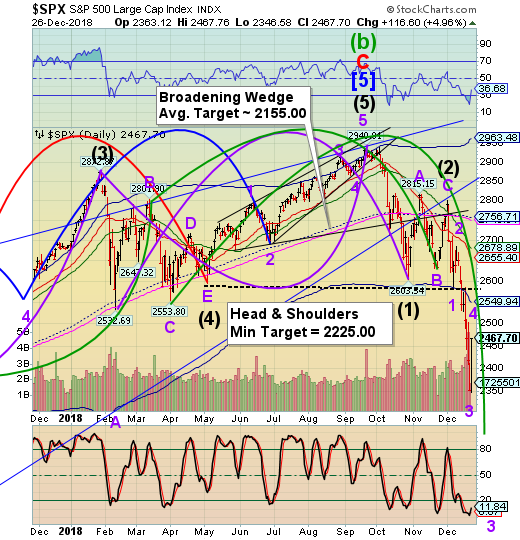 While the rally looks impressive, a bear market may give even more impressive declines. (TheGuardian) US stock markets staged a post-Christmas rally on Wednesday, soaring sharply higher after their worst ever performance on Christmas Eve. After wobbling at the open the S&P 500 Index, the DowJones and Nasdaq had all recorded significant gains by the end of the day. The Dow added over 1,080 points (4.9%), its biggest points gain in history, the S&P rose 4.9% and the Nasdaq, which has suffered the most in recent falls, closed 5.8% up. The Dow and S&P 500 dropped more than 2.5% on Christmas Eve, their worst ever pre-holidays performance. Worries about rising interest rates, Donald Trump’s attacks on the Federal Reserve for raising those rates, a government shutdown and the continuing trade tensions between the US and China have all rattled investors and the major indices were on the brink of a bear market – a 20% fall from their most recent high. The High Yield Bond Index declined to its lowest point for 2018 on Monday. Today it bounced, recovering all of Monday’s losses. However, the Cycles Model suggests that the decline isn’t over yet.